The seasoned professionals at Residential Electric Heating, Cooling & Insulation know our Bloomington residents want the best. 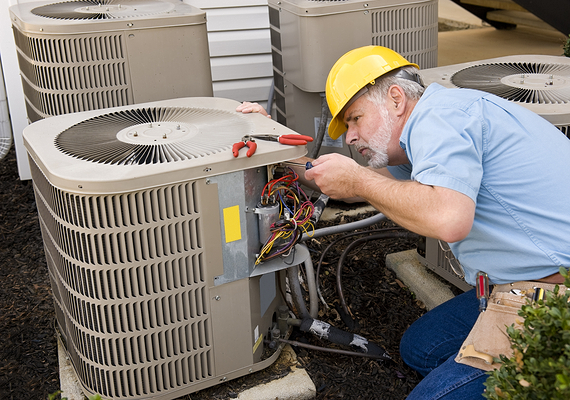 We only recommend certified and experienced Bloomington air conditioning contractors. You can count on our team to provide you with quick, efficient, and friendly service each and every visit. What Is an Air Conditioning Contractor? An air conditioning contractor installs, repairs, and maintains the ductwork, electrical equipment, and controls found in residential and commercial cooling systems. Depending on the problem being fixed, the job may require indoor or outdoor work. Some air conditioning contractors might travel to perform on-site repairs and maintenance. Heating and air conditioning contractors are both usually certified with a North American Technician Excellence (NATE) certification, which is the most respected award for heating and air contractors. Prospective contractors must pass a state-licensing exam before they can perform work on any heating or cooling system. The exam tests the contractor’s practical knowledge regarding the parts, functions, and repair techniques of heaters and air conditioners. Mechanical codes are also tested during the exam, which vary by state and ensure that the contractor protects clients’ homes and equipment while working on their systems. After passing the test, the air conditioning contractor is granted a license to practice in the industry, and compliance with the codes and regulations is a major responsibility that comes with the license. As you can see, when someone has earned the title of “air conditioning contractor,” you can feel confident in the service they will provide. The next time you need an electrical contractor in Bloomington, call Residential Electric Heating, Cooling & Insulation. Our seasoned professionals are available to you whenever you need them. Don’t hesitate; contact us today at 309-829-4230.